Gold Medal, SF Chronicle Wine Competition! The 2014 vintage offers a mélange of dried cherry, tobacco, and cocoa that unite amid luxuriously soft tannins. Judge's Selection & Gold Award, TEXSOM International Wine Competition! This seductive wine reveals the intensity of its 65+-year-old fruit source. It’s all about the wine. Refreshingly free from pretense and spectacle, we offer award-winning, handcrafted, single-vineyard wines of uncommon balance and elegance. As a member of the Tin Barn Vineyards Corrugated Club, you'll a get to explore your enthusiasm for artisan winemaking, connect with fellow oenophiles, and get delicious wine delivered right to your door. When do the shipments arrive? Tin Barn Vineyards sends Corrugated Club shipments every March and September. There is no fee to sign up for the Tin Barn Vineyards Corrugated Club. Each Corrugated Club sampler will cost the retail price of wine minus appropriate discount, plus the cost of shipping and applicable tax (California only). Your credit card on file will be approved and billed just prior to shipment of wines. Wines returned due to lack of signature or correct address on file will result in additional charges to resend. 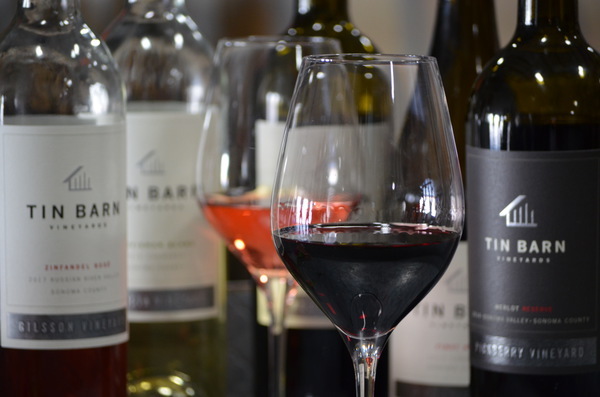 We'd love to have you join us at Tin Barn Vineyards! Choose your club and join now to start saving and enjoying our delicious Sonoma wines. We'd love to pour you a flight of our exceptional wines and share the fascinating stories behind them. We may even be able to fit you in right now. Tin Barn is a hidden gem, tucked away in rural Sonoma Valley, yet only three and a half miles from the historic Sonoma Plaza. We couldn't be more conveniently located! Come taste our award winning wines, and then spend the afternoon visiting unique artisan wines of the 8th Street warehouse neighborhood or shopping and dining in the charming Sonoma Plaza. From the Sonoma Plaza, drive south on Broadway until you reach Napa Rd. Turn left. The first light is Eighth Street East. Turn right and drive about a mile, past Peru Rd. (on the right) until you see industrial warehouses. Look for red sandwich board signs and red flags. Get into the middle turn lane, and prepare to turn left. Turn left at 21692 Eighth Street East. Drive through the warehouse complex, following signs for Tin Barn Vineyards. We are all the way in the back of the warehouse, where the vineyard meets the airport.